RESEARCH TRIANGLE PARK, NC--(Marketwired - September 28, 2016) - Although patient centricity becomes evermore prevalent in the pharmaceutical industry, companies have yet to settle on a consistent method or definition for measuring the success of their initiatives. A new study published by Cutting Edge Information found that one-fifth of surveyed pharma firms struggle to establish patient-centric initiative success metrics and properly demonstrate initiative value. Also, 20% of companies report challenges with patient engagement, internal processes and timelines. However, only 4% cite a lack of sustainability as an obstacle in the process of patient-centric development. 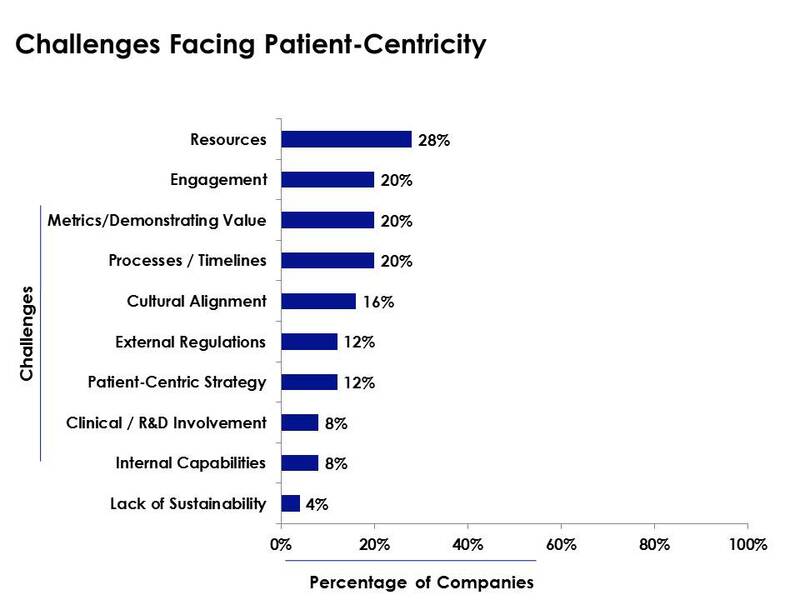 According to the study, Patient-Centricity 2.0: Communication Strategies to Boost Patient Engagement, almost one-third (28%) of surveyed companies reported limited resources being an issue for patient-centric establishment. One company reports that they are still in the process of expanding internal resources, and an interviewed executive explained that her firm is attempting to better access patients through digital marketing channels. 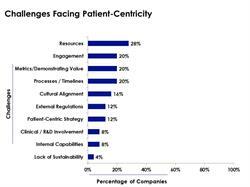 Other obstacles that companies face regarding patient-centricity include aligning company culture with patient-centric ideals (16%), facing external regulations (12%) and developing proper strategy (12%). "The definition of patient-centricity is changing to meet customer demands in the life science industry," said Adam Bianchi, senior director of research at Cutting Edge Information. "This entails operational challenges and opportunities for improvement. However, companies need to find what patient-centric means in terms of their operations and be able to show the success of customer-focused initiatives." Benchmark patient-centric initiative costs, staffing and duration to plot successful initiatives and ensure adequate support. Learn effective methods for measuring ROI, a consistent challenge for patient-centric programs. Increase awareness of -- and improve strategy and planning for -- patient-centric initiatives. Determine best-fit structures for disseminating patient-centric communication. For more detailed information on Cutting Edge Information's patient-centric benchmarking research, visit http://www.cuttingedgeinfo.com.